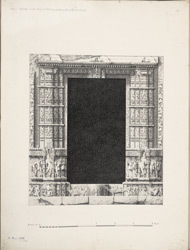 Illustration of the doorway from the north end of the courtyard of the Tanka masjid from James Burgess' 'Original Drawings [of] Muhammadan Architecture in Gujarat.' The Tanka masjid, at Dholka, was originally intended to be used as the Jami masjid or Friday mosque and was built c. 1361 by Mufakhr Mufarrah. The interior dimensions measure approximately 160 by 69 feet including two courtyards. Along the back wall, there are three mihrabs or prayer niches which recede almost four feet and supported by semi-circular buttresses. The corridors, along three sides of the mosque were constructed from pillars from a Hindu temple. At the north end of the building, there is an 18 feet square enclosure, with perforated screen work, which would have been a separate prayer room for women. Several of the decorative elements in the mosque have Hindu work including the north doorway with figure sculptures and the parapet of the south porch. ?There can be no doubt that this also was taken from some Hindu or Jaina temple, together with the doorway; and the figure sculptures on them were merely defaced. ?